Quality house signs & post boxes from Hayne-West. At Hayne-West we take pride in our workmanship and quality is of uppermost importance to us. We don’t use resin to emulate cast iron and we don’t use iron because it rusts. Our signs are made with meticulous care from genuine pure high quality aluminium, making them tough, hard-wearing and long-lasting. Simply choose your own combination of shape, size, emblem, wording and colour and leave the rest to our skilled craftsmen to make you a sign that will enhance your home for many years to come. Our house signs, gate signs, number plaques and nameplates are finished in a durable baked-on powder-coating, available in a choice of beautiful colours. Designed by ourselves in 1989, and still as popular as ever today, our lockable Hayne-West post box is available in two sizes with the same choice of powder-coated background colours. Not only are our post boxes extremely attractive but they are also sturdy and strong. Made from aluminium, rather than tin, our post boxes won’t rust. Available in standard traditional designs or personalised with your own wording and an emblem from our extensive range. From the initial modelling, through to the final hand-painting, our skilled craftsmen pay attention to detail at every stage of manufacture to ensure quality from start to finish. As you will see from the following outline, all our items are individually hand-made and go through many processes of manufacture. For this reason, personalised, or non-stock items, can take approximately six weeks to make. Some ‘special’ signs may take a little longer. We make all our own patterns, and model our own emblems in bas-relief from our art work in our studio. A model is sculptured and made into a mould. 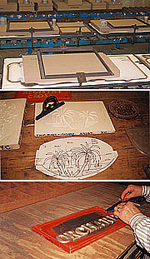 When the mould has set a rubber emblem is made, which is trimmed and sand-moulded to make a pattern for casting. When it has been cast it is then fettled (made smooth). The emblem is then ready to use on a sign pattern or post box with your own wording. Depending on the complexity of the emblem, this initial procedure can take a little while. However, we have many emblems that we have already made and are ready to use. You can see these on our emblems page. Should you not find exactly what you are looking for, please contact us as we have many more emblems too numerous to show on our website. Alternatively, as a cost option, we can make a new emblem or logo to your own design. There are many patterns to choose from, in a choice of sizes, to accommodate your own wording and choice of emblem. Again, if you don’t see exactly what you require, do contact us as we may still have what you are looking for or, alternatively, a new pattern can be made, as a cost option, to suit your individual requirements. The lettering and emblem is set out on a sign pattern and the spelling and layout finally checked before a sand-mould is produced. When the sand-mould has hardened the sign is ready to cast. Aluminium is heated in a powerful electric furnace until molten, then drawn off and poured into the mould. When cool, the sign is broken out of the mould for trimming and finishing. When the cast sign has been turned out of the mould, the edges are de-burred and the surface finely prepared for powder-coating. A durable polyester powder-coating, available in a range of six different colours, to protect your sign and make it look attractive, is then baked on at high temperature. Finally the embossed (raised) lettering and emblem/s are hand-painted by our talented artists, using special enamel paints, which are designed and produced in the USA to tolerate extremes of weather temperature. Our emblems are painted to look as natural, and as real, as possible, but we welcome any special colour requests. All we need is a clear picture showing the colours and markings of your dog, cat or horse, perhaps even your prized bull, and we will, as far as the limitations of the paint allow, replicate them onto your chosen emblem.